You can use the Financial Freedom Calculator to calculate what it would take to become financially independent. This tool is perfect for people that are thinking about retirement early on in life and what to know what they need to save to accomplish that goal. The template is also simple to fill out. All you need to do is enter the items requested by the template and the calculator shows you all the information you need to know. You can start saving for retirement, even if your 25, it’s never too early to start thinking about this important stage in your life. You can download the Financial Freedom Calculator file simply by clicking the link at the bottom of this page. When you have the template opened on your computer, start at the top of the page by entering your DOB. The template automatically calculates your age. Note: you only need to enter the items that are highlighted on the template. Everything else is calculated for you. If you plan ion retiring in a certain number of years, enter that figure in the next highlighted section. 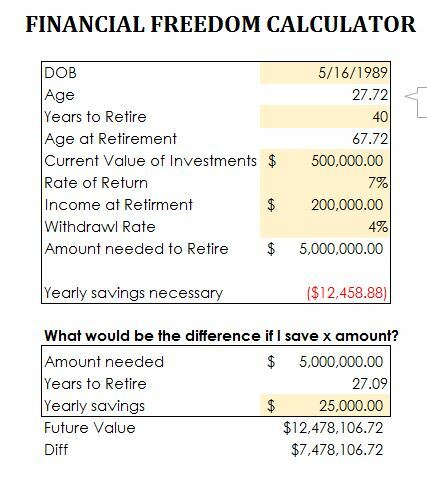 The template will show you the amount you need to save before you retire after you finish entering all the highlighted information. This figure is also listed as an annual sum. If you want to see the difference between the calculated amount and a different savings amount, you can see that in the next table below. In the last table of the template, you can see what age you can retire at by saving a certain amount as well. For example, if you don’t know when you want to retire but you know you’re saving 10,000 a year, then you can enter that figure in the last table to calculate your age of retirement.